Reishi Mushroom (Ganoderma lucidum) known as “Mushroom of Immortality,” is used for its immune and cognitive boosting properties. Known for being an excellent tonic and vitality boosting natural mushroom. Onlinestrength analyzed 10 best-selling Reishi Mushroom supplements in the United States, measuring levels of the key active ingredient Ganoderma lucidum, as well as recording any fillers such as binders, preservatives, artificial ingredients. Every Reishi Mushroom product passed ingredient quality standards. Supplements sourced from organic ingredients were rated higher. Products that contained any fillers of any kind were penalized. Reishi Mushroom (Ganoderma lucidum), commonly known as Ling Zhi, is traditionally used in Chinese and Japanese medicines. Frequently known as the “herb of spiritual potency,” for its ability to decrease fatigue, boost vitality, promote longevity, and improve overall sense of well being. Reishi mushroom supplementation is often used for its ability to help reduce clinical fatigue and its powerful anti-oxidant properties. Supplementation is well known for its ability to boost immune system health and prevent disease such as digestive issues, cancer, and general illness. Though further clinical research is still needed to solidify reishi muschrooms health benefits, Ganoderma lucidum shows promise in improving overall well-being and boosting energy which can be directly correlated to the anti-oxidant properties. Research shows that reishi mushroom extracts are used for supporting immune system and liver health. The actual reishi muschroom in its raw form has far more health benefits than the extract supplement formulation. Raw reishi mushrooms have triterpenes where as the extracts are often missing a few valuable compounds. Standard Dose for Reishi Extracts: 1800mg – 5200mg usually broken up into different dosages several times a day. 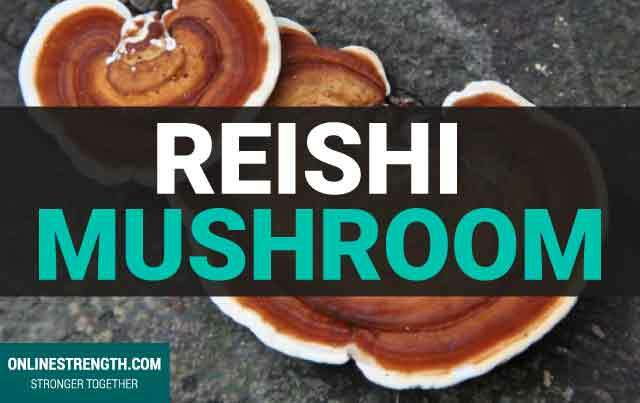 Reishi mushrooms that are grounded up and turned into supplements have 10x the potency as the raw mushroom. 100g of raw mushrooms is about the equivalent of 10g of reishi extract.